My NACBS: Our new series dedicated to building community and collaborations. This is the first post in our new series designed to introduce and connect NACBS members. Taking our lead from the American Historical Association’s member spotlight posts, we hope to deepen our sense of community through short posts that delve into who we are and what we value. For more information on this new series, contact Blog editor Stephen Jackson at [email protected]. I work on nineteenth-century Britain and the British Empire. I usually call myself a social and cultural historian but my work really includes political and intellectual history as well. The research projects I have done, while covering very different topics, have all addressed nineteenth-century debates about empire, gender, class, and political power. I am currently working on a project on letter-writing and the Post Office in nineteenth-century Britain and the British Empire. I am interested in letter-writing as a social practice during the era of industrialization, when more people had access to letters than ever before. Nineteenth-century discussions about postal infrastructure and letters speak to all kinds of important issues, including gender, migration, class, nation-building and empire-building, and literary genre. I love working at the National Archives in Kew. This was the first archive that I really worked at, and although I have worked at many others since then it still draws me back. I love how open and accessible it is, how easy it is to use, and how it draws all kinds of people from school children to academics to people researching their own families. Have you ever experienced a “break-through” moment while researching? What was it like? I had an interesting experience recently while working on my letter-writing project. While working in the Post Office archive in London, I began to look at Post Office appointment books, which for centuries listed the names and salaries of postal officials across the country. I realized that women who ran rural, colonial, and sometimes major urban post offices in Britain were in some cases making very high salaries and supervising large numbers of employees, at a time when almost no other government jobs were available to women. This made me realize that postmistresses and their circumstances were worth studying in their own right. What made this somewhat of a “break-through” moment for me was the fact that it drew me away from my initial purpose and into a side project of sorts, which was in fact very different from the primary project from which it arose. My interest in postmistresses has compelled me to look at a number of archival sources that are more obscure and specific than the more public sources I had been looking at about postal reform and theories of letter-writing. They have allowed me to reconstruct historical details about particular women who have not been part of the historical narrative about the Post Office. I have always been interested in European history, and my teaching and research interests remain transnational now. I may have been attracted specifically to studying Britain partly through reading nineteenth-century British novels. In college I double-majored in English and History and I continue to do interdisciplinary work. In some ways my interests have changed and in other ways they have remained remarkably consistent. When I finished my book about the British census and began doing research on letter-writing and the Post Office I was surprised to find how much overlap the topics had. While I thought that I was making a shift to thinking much more about everyday life through the social practice of letter-writing, I found that in fact both the census and postal reform were government projects that were billed as democratizers and national unifiers, that were supported by Whigs and that provoked suspicion among Tories, and that forced me to investigate the connection between government documents, newspapers, and more personal and sometimes literary sources. Does your project have any particular relevance to the contemporary? I am currently working on a project about a communication revolution of sorts – the moment when letter-writing became accessible to large numbers of people, and in some cases began to take over large segments of people’s everyday lives. This clearly has relevance to current discussions about communication. Like many people in our own time, nineteenth-century observers were interested in the question of whether faster, cheaper, and more regular communication fundamentally changed people’s relationships and ways of thinking about their own geographic mobility. How do you engage students in British studies? I try to engage students by exposing them to a wide variety of texts as well as musical and artistic productions from the past. In some cases, students may already be familiar with a particular text or other source, but they may not have read it or interpreted it through the lens of British history. As one example, I sometimes show a clip from the movie Mary Poppins that allows us to discuss gender norms and Empire in the Edwardian period. While most students are already familiar with the film, they are often surprised to see that it has relevance to the history that we are studying in class. I have so many favorite texts to teach! A few of my favorites in British Studies include Samuel Taylor Coleridge’s France, An Ode, Mary Prince’s A History of Mary Prince, Charles Dickens’ A Christmas Carol, a government investigative document called “Women Miners in the English Coal Pits,” Joseph Conrad’s “An Outpost of Progress,” and Andrea Levy’s novel Small Island. Do you have a book, museum, television series or film you would recommend to our readers? Two televisions series that are relevant to either my teaching or my research are Foyle’s War (about Britain during World War II, and particularly the social effects of war) and Lark Rise to Candleford (about a country post office and its postmistress in the late nineteenth century). A film that I sometimes teach and that I would recommend in general is The Wind that Shakes the Barley, about the war for Irish independence. Regarding museums and books, there are too many good ones to list! The road to Indigenous London, strangely enough, began in Seattle. For my doctoral research, I completed a dissertation that would eventually become Native Seattle: Histories from the Crossing-Over Place (2007), a book that examined three kinds of Native history in the city: the experiences of the local Duwamish people, in whose traditional territory the city was built beginning in the 1850s; the histories of Native migration to the city from other places, starting in the later nineteenth century; and the uses of “Indian” imagery such as totem poles and the iconic Chief Seattle in the urban imaginary, something that has always been a part of the city’s history. Instead of treating Indigenous and urban histories as mutually exclusive – a typical way to narrate North American history – I argued that they have in fact been mutually constitutive. During the same years that I was finishing Native Seattle, I was married to a Londoner. We travelled to the city on the Thames regularly, and each time, I found myself wishing I was not a historian of the nineteenth- and twentieth-century American West, but instead one with expertise in the kinds of history that would allow me to write about London. I was especially captivated by the idea of hidden histories within the urban landscape, from the works of Thomas de Quincey and Henry Mayhew through to P. L. Travers, Arthur Machen, Iain Sinclair, and China Miéville. I also became obsessed with lost rivers like the Effra and the Fleet, many of which still flow under the city. It was this sense of fugitive and occulted landscapes within a palimpsestic and deeply storied civic fabric that I found so compelling. And so, when my husband jokingly suggested I should write a book like Native Seattle about London, I at first scoffed, but quickly realized that this would be something potentially innovative. What would it look like to take the basic premise of Native Seattle – refracting a city’s history through Indigenous experience – and apply it to the centre of empire? The result is Indigenous London. It is a five-hundred-years-and-then-some history of London framed through the experiences of Indigenous women, children, and men to traveled to the city, willingly or otherwise, from territories that became Canada, the US, New Zealand, and Australia, beginning in 1502 and continuing into the early twenty-first century. Built around what I call “domains of entanglement” – knowledge, disorder, reason, ritual, discipline, and memory – and including six poetic interludes built out of archival fragments, the book, parallel in many ways to Native Seattle, makes the claim that London’s urban history is bound up with the histories of Indigenous peoples throughout these four settler societies. To get at this history, I not only had to become conversant in the histories of, for example, the Māori peoples of Aotearoa/New Zealand, but to work my way into the massive literature on the social and cultural history of London itself. The research not only took me to archives with strong Indigenous holdings – most notably the Newberry and Huntington libraries – but deep into the stacks of the British Library and the Institute for Historical Research. For example, one of the stories in Indigenous London that readers tend to have strong responses to is that of Nutaaq, an Inuit baby who was put on display in a City tavern in 1577 but who died soon after. He was buried at St. Olave’s Church, Hart Street. To understand Nutaaq’s context, I not only had to survey the history of Inuit-English encounters in the early modern period; I also needed to create a “deep map” of St. Olave’s, a church whose most famous congregant was Samuel Pepys. (Indeed, the fragmentary archive related to Nutaaq, contrasted with Pepys’s encyclopedic, self-referential corpus, symbolizes for me the very nature of colonialism.) I also needed to include the story of Peter Morin, a Tahltan scholar and performance artist from Canada, whose “cultural graffiti” in London included a 2013 ceremony to honour the spirit of the lost boy. This interleaving of the urban and the Indigenous, of the past and the present, is emblematic of the work I was trying to do with Indigenous London. Another interleaving of this sort can be found on the cover of the book. In 1762, three Cherokee diplomats traveled to London to cement peace after the close of the Anglo-Cherokee War. Like Indigenous travelers before and since, Utsidihi, Kunagadoga, and Atawayi were massive celebrities during their time in the city, with references to their stay appearing in London newspapers and even in the work of William Hogarth, and their political work resonated in Cherokee territory as well. Two hundred and fifty years later, in fact, the Cherokee Nations sent a delegation to Britain to walk in the footsteps of the three diplomats. 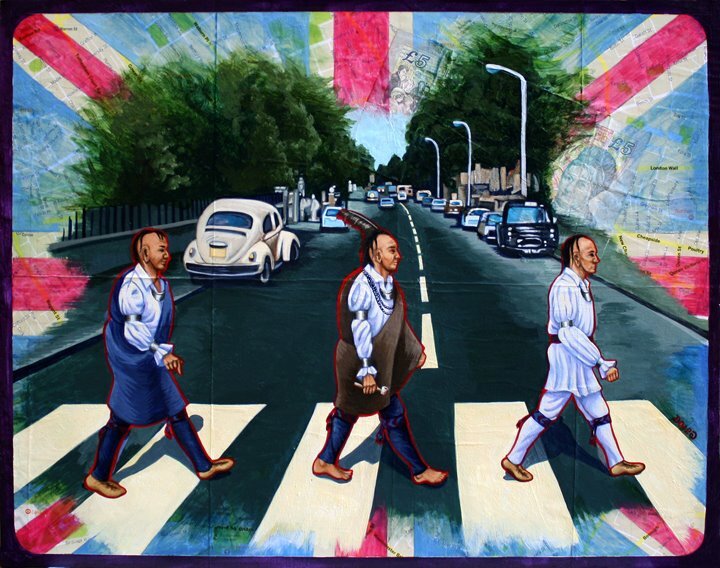 Among this group was an artist named America Meredith, who commemorated the 2012 trip by creating a work that imagined the three original travelers walking across the iconic Abbey Road zebra crossing. Simultaneously iconically London and immediately recognizable as Indigenous, the image does work that parallels the story I was trying to tell, of the intersections between urban and Indigenous histories on a global and imperial scale, and of the power of Indigenous memory despite the traumas of settler colonialism. There are so many other stories to share: not just of captives and diplomats, but of athletes and poets, medicine people and missionaries, and many others. And these are just the stories of London; there are other projects currently in the works on Indigenous histories in other imperial cities: Rome, Madrid, and beyond. To tell these kinds of urban Indigenous histories is to reframe not only the cities in question, but the place of Indigenous history in world history. Instead of relegating Indigenous peoples to the past as foils to global modernity, this work illustrates the ways in which Indigenous people and peoples were co-creators of that modernity. To do so, I hope, speaks back to empire in solidarity with today’s Indigenous communities and nations. Coll Thrush is professor and graduate chair at the history department of the University of British Columbia. The final program for the 64th Annual Midwest conference on British studies, to be held in St. Louis from September 28 through October 1, can be downloaded here: MWCBS Final Program-2017.